A popular favourite with bloggers, this brunch restaurant is located 40 floors up. Enjoy many classics as well as their picture-perfect waffles and savoury treats. 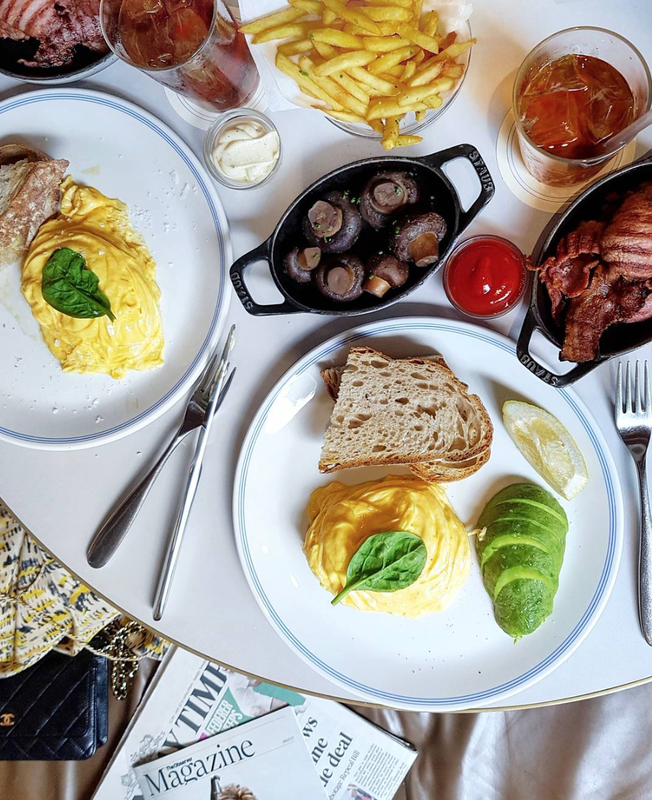 Delivering fresh, seasonal food from farm to table, Sea Containers at Mondrian London offers a mouthwatering weekend English-American brunch menu until 4pm. We recommend the Egg Sammy with a Bottomless Grey Goose Bloody Mary for a perfect weekend pick-me-up! A slightly healthier option for brunch, this Australian restaurant is a sunny and easy-going to relax you into the weekend. Find foodie favourites such as acai bowls, chia pots and avocado toast. We highly recommend the ricotta hotcakes with banana and honeycomb butter. Find their London restaurants in Chelsea, Clerkenwell, King's Cross and Notting Hill. For more inspiration, follow @IGBrunchClub on instagram for a daily dose of London's best brunch hotspots. Who would guess that such a beautiful rose could be made of delicious ice cream! Artisan Italian Gelato and sorbets are made daily right in the heart of London at Amorino using fresh ingredients, as well as macaroons that can be added to your rose. With over 50 flavours you'll be spoilt for choice; but decide quickly before it melts! Hidden away in Chinatown, this new foodie sensation has taken Instagram by storm. Inspired by egg waffles that first appeared in the streets of Hong Kong, these tasty snacks can be stuffed with ice-cream and toppings galore. Our favourite is the Oreo Crunch, but if you're heading to get yourself a sweet treat make sure you have some time on your hands, with queues up to 1.5 hours long! Quite literally ice cream heaven, these funky little soft whip ice creams sit on top of a candy floss cloud! Choose from vanilla, hojicha or matcha plus a variety of toppings. Creator of the Cronut, this London Bakery is the brain-child of Chef Dominique Ansel, named the World’s Best Pastry Chef of 2017. A croissant-doughnut hybrid that is bound to get your mouth watering and Instagram buzzing with notifications. The most virally talked about dessert item in history and deemed by TIME Magazine as one of the best inventions of the year, you need this little sweetie on your feed! Always a favourite, Sushisamba not only offers beautifully plated food but also spectacular views across London from its 39th floor location. Beautiful design is expressed both inside the restaurant and on the plate, making for happy snapping all around! With a big focus on nutrition, sustainability, quality and variety, this laidback all-day restaurant allows excited customers to build their own perfect looking poké bowl. for seriously good-looking sushi and cocktails head to Murakami on St. Martin's Lane to add some style to your feed. This modern Japanese restaurant not only offers sushi but salads, Japanese tapas and grill choices. Try the extra-special Murakami Rolls for the full experience.